Wendy Mewes, author of this excellent guide to cycling the Nantes-Brest Canal, has this overview of Brest, the largest city in Brittany. Brest is the largest city in Brittany's Finistère department by virtue of its international maritime status, but it's not the capital (see Quimper). Every four years - next in 2012 - it hosts the huge Fete Maritime Internationale, with literally thousands of boats strutting their stuff. It has the finest roadstead in Europe in the Rade de Brest, a vast inland sea, connected to the Atlantic by a narrow channel, the Goulet. You can enjoy excellent views of this with a stroll along the Cours Dajot, a promenade built in 1769 by prison labour. The superb protected harbour has made Brest the French naval Atlantic headquarters since the 17th century. It was a German submarine base in WW11, hence heavy Allied bombing which destroyed most of the city. Guided tours of the base are available today. After the war, rebuilding had to be swift to house a large population and so the current city is full of not particularly attractive modern architecture. An exception is the remarkable Church of St Louis, the largest post-war church in France with room for 2500 people, and well worth a look. The medieval chateau survived the onslaught and today houses a good maritime museum. On the opposite side of the Penfeld river, over the Recouvrance bridge, is the 14th century Tour Tanguy, now restored and offering an unusual display of the history of Brest, not to be missed, especially as entry is free. The centre is a grid-plan of long shopping streets, the main one being the Rue de Siam, named in honour of the ambassadors of the King of Siam who arrived exotically in 1686. At the top you’ll find the tourist office in a wasteland of ugly concrete development. The city has a lively night-life with plenty of contemporary music venues, concerts, theatre and dance. The commercial port area has the best bars and restaurants, with live outdoor music on Thursday evenings in summer. Three kilometres to the east of the centre is Moulin Blanc with the large pleasure port and the famous Oceanopolis (French only), one of the most visited attractions in France, with its pavilions of sea-creatures from all climates. You can take a boat around the Rade with Azenor Cruises (French only) from here. To the west (c30km) lies the Pointe St Mathieu with its dramatic ruined abbey and lighthouse on the cliff-top, and the delightful fishing town of Le Conquet, where you can get a boat to the island of Molène and Ouessant (also boats from Brest). If you want to see the largest standing stone in France (near St-Renan) or the westernmost point of France (the Pointe de Corsen), both are within easy reach of Brest. Cycle-lanes do exist in the centre as streets tend to be broad, but locals say it is not a good place for cyclists. Getting out of the city at rush hour can be a nightmare by any method of transport. However the city is steeped in bicycling history, with the Paris-Brest-Paris bike ride still the oldest surviving regular cycling event. For bike hire, see our Brittany bike hire listings. As we explain in our guide to cycling the Nantes-Brest Canal, despite its name, the Nantes-Brest Canal does not actually reach Brest; it finishes at Guily Glas, some 40km from the city. It can prove a challenging experience cycling from the end of the canal to Brest (or vice versa). Instead, take the train between Chateaulin and Brest. Brest is on the main TGV train line with trains via Morlaix (links to the ferry at Roscoff) to Rennes, or south to Quimper. 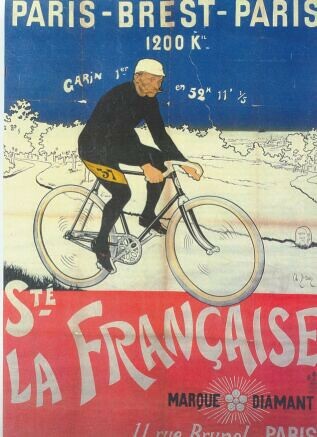 See also our information on taking bikes on French trains. An expressway road links Brest and Quimper, but it is possible to travel south via minor roads around the peninsulas hemming the Rade de Brest – see the Red Dog guide to the Nantes-Brest Canal. The tourist office can help with finding accommodation. The most attractive area to stay is near the water at Moulin Blanc (3km from the city centre) – try the Hotel La Plaisance and ask for a sea view. A cheap, fairly central option handy for the commercial port and ferries to Molène or Ouessant is the hotel Agena. Check here for a range of links to hotels, gîtes, gîtes d’étapes, B&Bs and self-catered accommodation around France, and here for more tips for finding accommodation. Brest being an international sort of place leads to a great variety of restaurants, but the traditional Breton fish dishes are still the best. For fun with a crab, try Le Crabe Marteau, where you get a crab on a wooden board with a mallet. The Amour de Pomme de Terre near the market (rue des Halles St Louis) certainly lives up to its name, with groaning platters featuring potatoes every way imaginable. The revamped area around the docks also boasts lots of dining options. See Wendy's Freewheeling France guide to cycling the Nantes-Brest Canal, as well as her history of the Nantes-Brest Canal. She has also written our guides to Brittany, St Malo, Quimper, Vannes and Rennes.